Stitches used: ch, sl st, sc, dc, tr. RND 1: Chain 4, 11 dc in 4th ch from hk. Join with sl st in top of beg ch4. Ch 1, turn. RND 2: Sc in same st as ch 1, ch 4, * sk next st, sc in next st, ch 4. Repeat from * around. (6 ch 4 sps) Join with sl st in sp where you did the 1st sc. Ch 5, turn. RND 3: * Sc in next ch 4 sp. Ch 5, sc in next sc, ch 5. Repeat from * around. Join with sl st in 1st sc. Ch 3, turn. RNDS 4: (Dc, ch 2, 2 dc) in next ch 5 sp. Sc in next ch 5 sp, *(2dc, ch 2, 2 dc) in next ch 5 sp, sc in next ch 5 sp. Repeat from * around. Join with sl st in top of 1st dc. Ch 1, turn. RND 5: Sl st in next sc, ch 3, (dc, ch2, 2dc) in same sp as ch 3. Ch 2, sc in next ch 2 sp, ch 2. *(2dc, ch 2, 2 dc) in next sc, ch 2, sc in next ch 2 sp, ch 2. Repeat from * around. Join with sl st in top of 1st dc. DO NOT TURN. RND 6: Sl st in next dc, sl st in next ch 2 sp, ch 4, 2 tr in same sp. * Ch 3, 3 tr in next sc. Ch 3, sk next ch 2 sp, 3 tr in next ch 2 sp. Repeat from * around to last sc, 3 tr in the last sc, ch 3.) Join with sl st in top of 1st tr. DO NOT TURN. RND 7: Sl st in next tr (center tr in set of 3 tr). * Ch 4, sc in next ch 3 sp, ch 4, sc in center tr of next set of 3 trs. Repeat from * around to last set of 3 trs, ch 4, sl st in same sp as 1st sc. DO NOT TURN. RND 8: Sl st in next ch 4 sp, sc in same ch 4 sp, * ch 6, sc in next ch 4 sp. Repeat from * around to last sp, ch 6. Join with sl st to 1st sc made. DO NOT TURN. RND 9: Sl st in next ch 6 sp, ch 3, (dc, ch 2, 2 dc) in same sp. (2dc, ch 2, 2 dc) in each ch 6 sp, around. Join with sl st in 1st dc. RND 10: Sl st in next dc, sc in next ch 2 sp. Ch 3, (dc, ch 2, 2 dc) in same sp. * Ch 2, (2dc, ch 2, 2 dc) in next ch 2 sp. Repeat from * around. After the last dc is made, ch 2. Join with sl st in 1st dc. DO NOT TURN. RND 11: Sl st in next dc, sc in ch 2 sp. Ch 3, (dc, ch 2, 2 dc) in same sp. * 3 dc in next ch 2 sp. (2 dc, ch 2, 2 dc) in next ch 2 sp. Repeat from * around to last ch 2 sp, 3 dc in last ch 2 sp. Join with sl st in 1st dc. DO NOT TURN. RND 12: Sl st in next dc. Sc in ch 2 sp, * ch 6, sc in next ch 2 sp. Repeat from * around. Join with sl st in 1st sc. RND 13: * Ch 5, sc around center of next ch 6 sp. Ch 5, sc in next sc. Repeat from * around to last ch 6 sp, ch 5, sc in center of next ch 6 sp, ch 5. Join with sl st in 1st sc. RND 14: Sc in next ch 5 sp, Ch 4, 5 tr in same sp. 6 tr in each rem ch 5 sp. Join with sl st in top of beg ch 4. RND 15: Ch 4, tr in same sp as beg ch 4. 2 tr in each tr. Join with sl st in top of beg ch 4. 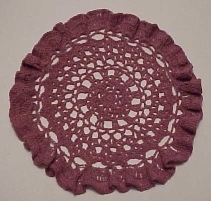 TO FINISH: Lay doily on a flat surface and shape the ruffle. You may use a stiffener/starch if you wish but it doesn't really need it.